Below are a selection of itineraries which will help you and your group plan your day out in Oxford, including a visit to Oxford Castle & Prison. 10 am Start your day at Oxford Castle & Prison, which has recently been confirmed as the birthplace of the Legends of King Arthur. Join one of our 40-minute guided tours, taking in the Saxon stone-built St. George’s Tower and the Georgian prison wing before descending to the atmospheric crypt, where Geoffrey of Monmouth would have walked the footprint of the crypt whilst penning his notable tome. Groups of 15 or more enjoy a price of £9.40 for adults. Please call us on 01904 261262, or email us at groups@continuumattractions.com. Our group bookings office is open Monday to Friday, 9.00am to 5.30pm. 11.30am Visit the Bodleian Library. Take a one hour guided tour of the library and the Radcliffe Camera. Explore the Divinity School, built in 1488 for the teaching of theology. With its elaborately vaulted ceiling and its 455 carved bosses, it is a masterpiece of English Gothic architecture. 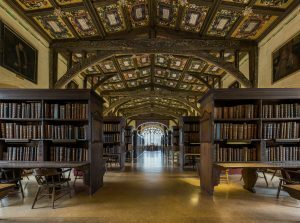 The combined collections of the Bodleian Libraries number more than 11 million printed items. The library is open all year round. Please note that advance group bookings cannot be taken in July or August. A tour is £7. To book, call 01865 287 400. 1.00pm Lunch at The Eagle and Child, a pub well known as the meeting place of a group called The Inklings, comprised of literary greats including CS Lewis, J.R.R. Tolkien, Charles Williams and Nevill Coghill. There is a wide-ranging menu, so your group can make a quick stop for a sandwich or enjoy a three-course meal. Call 01865 302925 to book. 2.00pm Walk along to Magdalen College on the High Street to take in the college where CS Lewis taught English Language and Literature for almost 30 years (1925-1954). 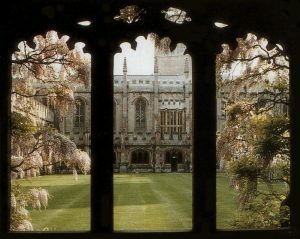 During his time at Magdalen college, five of the seven Chronicles of Narnia books were published to great acclaim. Apart from its literary history, the 550-year-old buildings are some of the most picturesque in Oxford and also boast award-winning gardens. The college is open for the entire year, from lunchtime onwards. Entry is £5 for adults. Groups should book in advance by calling 01865 276 000. 4.00pm Alice’s Shop, St Aldates One of the most famous little shops in the world can be found on St Aldates just across the road from Christ Church College. The Alice’s Shop in Oxford is world famous because the shop itself was written into the Alice adventures over 150 years ago. Spend some time browsing the wondrous wares of the Alice’s Shop, a treasure trove of Alice in Wonderland themed gifts, souvenirs and memorabilia. 10.30am Ice Cream @ G&Ds – A mid-morning snack at Oxford’s premier independent ice cream café. Flavours range from the more traditional vanilla and strawberry to the more distinctive flavours including Green Tea, Turkish Delight and Dimebar Crunch. 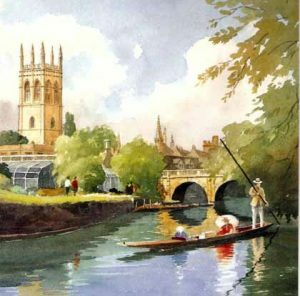 11.30am Punting on the River (seasonal, open February to November) – Complete the ultimate Oxford tradition of punting on the river Cherwell. Float along the river past the Botanic Gardens, around Magdalen College and up past Christ Church meadow. A boat can take up to five people and cost £18 an hour (weekdays), £20 an hour (weekend). The Magdalen Bridge Boathouse is open seven days a week. 2.20pm Oxford Castle & Prison Tour – Scale the Saxon tower of St. George then delve into the depths of the atmospheric ancient crypt and explore the Georgian prison wing on a 40 minute guided tour. Call to book your Oxford Castle & Prison visit please call us on 01904 261262, or email us at groups@continuumattractions.com. Please note we cannot book Oxford punting or dining at The Eagle & Child. This is a suggested itinerary only.